Volvo C303 - uneven braking - THE PORTAL HUB - Pinzgauers, Haflingers, Volvo 303s and more! Hi all Portal Hub enthusiasts. 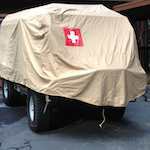 My name is Steve, I live in New Zealand and I bought recently a very clean and well maintained 1978 C303 ex Swedish military radio vehicle. I think it is the only one in the country. I have a problem with the brakes. Front wheel cylinders replaced two weeks ago, back wheel cylinders replaced about 18 months back...all brake linings near new and brakes bled according to workshop manual. All work carried out by very competent and trusted workshop however the mechanic cannot get the vehicle to have even stopping power. Mechanic thinks there may be an issue in the servos however, if anyone has advice or foresight on this issue I would be very grateful. Can you describe what you mean by "even stopping power"? For instance heavy braking results in a pull to one side or the other? Thanks rmel. i meant the truck pulls to the left... not suddenly but gradually...enough to make it fail the 'road worthy' test or what we call a warrant of fitness (WOF). All vehicles in NZ have to pass a WOF test every 6 months to be legal on our roads. The brake shoes have all been correctly adjusted to the brake drums but we still have the problem of one side ending up with more force than the opposite side. Its possible the rear brakes are locking up too. Very confusing! If the pressure in all tires is the same I first would give the right side one more klick to the brake shoes. You have to try that out. May be there is only one brakeshoe possible to move nearer to the drum. Appreciate all the feedback from people. The servos were in the back of my mind...we are still working on the brakes. I'll let you know what the outcome is when problem overcome. Brake servos should be effecting front to back, not side to side. Possible the mech didn’t understand the bleeding procedure for the front and back interconnected lines. Each back wheel brake activates one of the wheel cylinders on the opposite front tire. Based on the brake circuit diagram for a TGB11, if one servo was weak there would be differential braking performance on the rear wheels only, the fronts would stay balanced. This might cause the car to drag to one side under braking? Thanks to robber_and_custard & dokatd for valuable information/diagram. Mechanic aware of these points and I had given him a full workshop manual (in English!). If servos the problem...can anyone recommend where to obtain servo rebuild kit/reco unit etc? I've perused Tatanka website and aware of replacement brake servo cylinders for sale...possibly another supplier out there? I wanted to sincerely thank all the people who contributed to my C303 technical issue with the brakes. The problem is solved through a combination of relining all rear brakes shoes, copious bleeding procedure and adjustments. The brake pedal remains spongy but the truck stops in a straight line and is now road legal. My intention is to sell the truck so if any interest keep an eye out on The Portal Hub's 'For Sale' section.